How have you been doing with creating your most incredible year? Have you been able to surrender control and allow the unexpected? What about letting go of limitations? I know it can be challenging, but if you did it, I'm sure you'll agree that it is very freeing. Today's step focuses on the importance of forgiveness. But it isn't about forgiving people who have wronged you or hurt you. But what we're focusing on today is forgiving yourself. Because You Are Good Enough Exactly As You Are! So many amazing, wonderful, kind, generous people beat themselves up daily for failing to meet a self-imposed standard or a requirement someone else believes they didn't meet. There are fantastic mothers and fathers beating themselves up for not spending enough time with their children, even though they were doing the best they could. There are great men and women beating themselves up for not getting married by a certain age. They want to find the perfect person for them, and are actively looking. They don't want to get married just to get married. They are doing what is best for them, yet it haunts them. What do you most regret about the past year? What will you do about it this year? Whatever you regret, it's okay! You're human. Everyone makes mistakes. Everyone fails at something. Everyone has a goal they didn't meet. It doesn't mean you're a failure. It means you're normal! I want you to understand that. You did nothing wrong. You did the best you could at the time. You're going to forgive yourself! I encourage you to take the biggest dose of forgiveness possible. Forget about what happened. Release it. That's why you're not going to keep beating yourself up. You're not going to keep talking and thinking about everything that isn't right or what went wrong. Negative thinking and self-judgment won't help you! They only attract more problems and lower your self-esteem, making you feel even worse! Write down everything you regret doing in the past. Forgive yourself for all of it. I know it may be hard. But if you want to move on and create your best life, you have to forgive yourself. Lack of forgiveness distorts the world around you. It's baggage filled with regrets and negative emotions. It's the lower vibrational energy and resistance that prevent you from manifesting your desires. When you forgive yourself, you leave all of that behind. You shift the blocked energy that was created by regrets, blame, guilt, and shame. You raise your vibrational energy and attract better circumstances in your life. Forgiveness is a way out of the past. It empowers you and frees you. Abundance begins to flow in all areas. Major shifts and transformations can happen quite quickly in the area you forgave yourself. Your entire energy field changes as you are more loving towards yourself – allowing more loving circumstances to appear in your life. 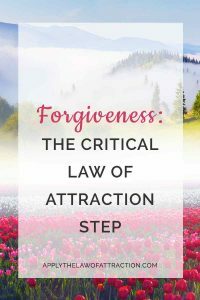 Commit to forgiveness and watch the Law of Attraction change your life. Thank you Elizabeth for suggesting this article to me. I realized that I had to forgive myself for my thoughts that were holding me back. I did the steps above – the only part I wrote down was a detailed note to myself that I was forgiving myself for all the negative thoughts of the past year, etc. Since I did that, I feel so much better and finally able to detach and let go of resistance. I understand now that my resistance and such had built up due to the fact that I had to forgive myself in order to fully let go of the cycle of self doubt, fears, worries. I am so grateful to you for taking the time to email me back and suggest the articles you did! You really helped me! And…I asked for a clear sign from the Universe and GOT ONE!! The Universe gave me a sign I could not miss. With the relationship I am manifesting, for weeks there was not as much affection. Today for the first time in WEEKS I got a very affectionate text from my guy! I knew right away that was a sign from the Universe. I am so grateful! Thank you again Elizabeth I really appreciate it! You truly do help people. I’m so glad I was able to help PJ!